Until late 2006, global temperatures were more than a degree Fahrenheit warmer when compared to the 20th Century average. From August of 2007 through February of 2008, the Earth's mean temperature dropped to near the 20th Century average of 57 degrees. Since that time, land and ocean readings have rebounded to the highest levels in recorded history in 2016 with a temperature of 58.69 degrees Fahrenheit. For 2017, the global temperature was 58.51 degrees Fahrenheit. We, Climatologist Cliff Harris and Meteorologist Randy Mann, believe in rather frequent climate changes in our global weather patterns. Geologic evidence shows our climate has been changing over millions of years. The warming and cooling of global temperatures are likely the result of long-term climatic cycles, solar activity, sea-surface temperature patterns and more. However, Mankind's activities of the burning of fossil fuels, massive deforestations, the replacing of grassy surfaces with asphalt and concrete, the "Urban Heat Island Effect" are likely creating more harmful pollution. Yes, we believe we should be "going green" whenever and wherever possible. By contrast, evidence shows there have been at least five major ice ages on Planet Earth. One of the most well-documented and largest, occurred from 850 to 630 million years ago, is called the Cryogenian period. Glacial ice sheets likely reached all the way the equator producing a "Snowball Earth." Scientists believe that this massive ice age ended due to increased underground volcanic activity and, perhaps, a much warmer solar cycle. One reason scientists believe that the Earth's temperature reached a record level in 2016 was the very strong El Nino in the waters of the south-central Pacific Ocean that formed in 2015. El Nino is the abnormal warming of ocean waters that often leads warmer air temperatures and less snowfall during the winter seasons. In 2007-08, a moderately strong La Nina, the cooler than normal sea-surface temperature event, combined with extremely low solar activity (storms on the sun), resulted in a period of global cooling and record snowfalls across many parts of the northern U.S., Europe, Asia and the Former Soviet Union. The same type of situation, perhaps more severe, could occur again in the early 2020s, especially if we see a strong La Nina combined with very low solar activity. Climate scientists are not completely certain why ocean waters suddenly warm up and cool down over a period of months or years. The warming of sea-surface temperatures may be due, at least in part, to increased underwater volcanic activity. Researchers are constantly finding new active underwater volcanoes and thermal vents that may be contributing to the warmer temperatures. Recently, scientists discovered at least three to six times more heat-spewing thermal vents along the seafloors where tectonic plates are pulling apart. In 2003, at least nine hydrothermal vents along the Gakkel Ridge in the Arctic Ocean were found. Arctic ice has been melting at a steady pace in recent years and may be due to the warmer than normal ocean waters. In April 2015, an underwater volcano known as the Axial Seamount, about 300 miles off the coast of Oregon, erupted for a month and added 88 billion gallons of molten rock to the ocean floor. By contrast to the Arctic ice melt, glaciers have been thickening in Antarctica's eastern interior. That portion of the continent was experiencing increased snowfall and had a gain of about 100 billion tons of ice per year from 1991 to 2008. But, there has been loss of glacier mass in Antarctica's western region. From the late 1940s through the early 1970s, a climate research organization called the Weather Science Foundation of Crystal Lake, Illinois, determined that the planet's warm, cold, wet and dry periods were the result of alternating short-term and long-term climatic cycles. These researchers and scientists also concluded that the Earth's ever-changing climate likewise has influenced global and regional economies, human and animal migrations, science, religion and the arts as well as shifting forms of government and strength of leadership. Much of this data was based upon thousands of hours of research done by Dr. Raymond H. Wheeler and his associates during the 1930s and 1940s at the University of Kansas. Dr. Wheeler was well-known for his discovery of various climate cycles, including his highly-regarded "510-Year Drought Clock" that he detailed at the end of the "Dust Bowl" era in the late 1930s. One of the most recent cold periods was "The Little Ice Age," a 500-Year plus span that extended from the early 1300s to the mid 1800s. During that time, there was little solar activity, or solar storms, which scientists refer to as the “Maunder Minimum.” There were also numerous volcanic eruptions in the 1800s like Krakatoa and Mt. Tambora. In 1815, Mt. Tambora has a major eruption which was the largest recorded one in human history. The explosion sent thousands of tons of ash and dust into the atmosphere resulting in the lowering of Earth's temperature by several degrees and numerous extremes. The event also led to a "year without a summer" in 1816 across parts of northern Europe and U.S. as snow was reported in each month of the year, including the summer season. During the early 1970s, our planet was in the midst of a colder and drier weather cycle that led to concerns of another "Little Ice Age." Inflationary recessions and oil shortages led to rationing and long gas lines at service stations worldwide. Since that time, global temperatures have steadily climbed to the levels they are today. But, there were several interruptions of this global warming cycle. In June, 1991, Mt. Pinatubo erupted in the Philippines leading a temporary drop of about one degree of the Earth's average temperature. In the late 2000s, a strong La Nina and very low solar activity helped to send our planet's average temperature down to near the 20th Century average of 57 degrees before rebounding in the early 2010s. 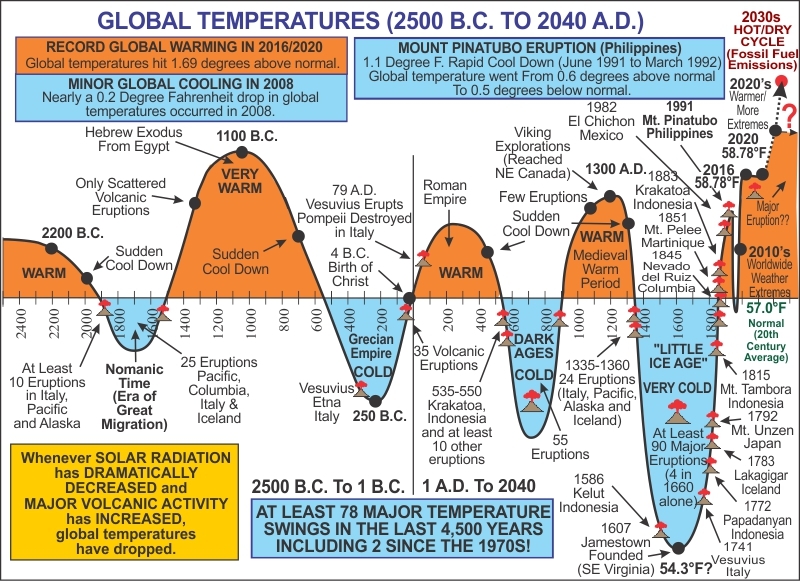 The Weather Science Foundation also predicted, based on these various climate cycles, that our planet would turn much warmer and wetter by the early 2000s, resulting in general global prosperity. They also said that we would be seeing widespread weather "extremes." There's little doubt that most of their early predictions came true. In 2016 alone, data from NOAA shows that over 200,000 heat, cold and precipitation records were broken across the globe. Nearly 60 percent of the records were warm, about 28 percent were precipitation and snow and the rest were cold. However, in early 2017, some of the coldest weather in recorded history was seen across northern U.S., Europe, Asia and Siberia in Russia where one station in early January 2017 went to -81 degrees Fahrenheit. Dr. Wheeler also discovered that approximately every 102 years, a much warmer and drier climatic cycle affects our planet. The last such "warm and dry" peak occurred in 1936, at the end of the infamous "Dust Bowl" period. During that time, extreme heat and dryness, combined with a multitude of problems during the "Great Depression," made living conditions practically intolerable. Assuming we get a new and very strong cooler La Nina sea-surface temperature pattern along with extremely low solar activity, we may see a brief cool down of the Earth's temperature around the early 2020s. The next “warm and dry” climatic phase is scheduled to arrive in the early 2030s, probably peaking around 2038. It's quite possible we could see an average global temperature near 60 degrees, assuming there isn't a major volcanic eruption to disrupt this cycle. Based on current data, this new warmer cycle could produce even hotter and drier weather patterns than we saw during the late 1990s and early 2000s. We also believe that our prolonged cycle of wide weather “extremes,” the worst in at least 1,000 years, will continue and perhaps become more severe in the years to come. We should remember, that the Earth's coldest periods have usually followed excessive warmth. Such was the case when our planet moved from the Medieval Warm Period between 900 and 1300 A.D. to the sudden “Little Ice Age,” which peaked in the 17th Century. Since 2,500 B.C., there have been at least 78 major climate changes worldwide, including two major changes in just the past 40 years. In terms of upcoming cooling and warming periods, only time will tell.